"Hallelujah", in its original version, is in 12/8 time, which evokes both waltz and gospel music. Written in the key of C major, the chord progression matches lyrics from the song: "goes like this, the fourth, the fifth, the minor fall, and the major lift": C, F, G, A minor, F.
Cohen wrote around 80 draft verses for "Hallelujah", with one writing session at the Royalton Hotel in New York where he was reduced to sitting on the floor in his underwear, banging his head on the floor. His original version, as recorded on his Various Positions album, contains several biblical references, most notably evoking the stories of Samson and traitorous Delilah from the Book of Judges ("she cut your hair") as well as the adulterous King David and Bathsheba ("you saw her bathing on the roof, her beauty in the moonlight overthrew you"). Following his original 1984 studio-album version, Cohen performed the original song on his world tour in 1985, but live performances during his 1988 and 1993 tours almost invariably contained a quite different set of lyrics with only the last verse being common to the two versions. 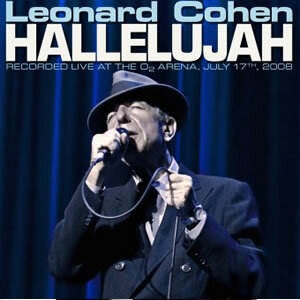 Numerous singers mix lyrics from both versions, and occasionally make direct lyric changes, such as Rufus Wainwright, a Canadian-American singer, substituting "holy dark" and Allison Crowe, a Canadian singer-songwriter, substituting "Holy Ghost" for Cohen's "holy dove".